MPECS Inc. Blog: Windows Server Virtual Calculator ... VS Licensing - A good deal or not? 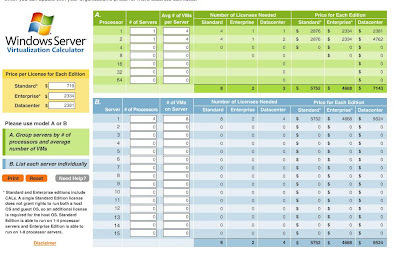 Windows Server Virtual Calculator ... VS Licensing - A good deal or not? I must admit, that licensing Microsoft products for virtualization has been at best a rat's nest. Following a link from the Microsoft Virtual Server 2005 R2 web site, there is a link to Virtualization.info that links back to Microsoft's site and the new Windows Server Virtualization Calculator. Also contained within the comments on the Virtualization.info site was a link to a fellow who built an Excel spreadsheet that can do the same thing as the online one. It is the Windows Virtualization Calculator at vi411.org. The tool is pretty neat. It does help to clarify some aspects of licensing Microsoft products, at least when it comes to Host/Guest OSs. It primarily deals with OLP style licensing and not OEM. The second line in the paragraph really caught my attention: "Standard Edition grants the use rights to run a single virtualized instance of Windows Server Standard Edition." Um, Microsoft, what exactly are we doing here?!? I mean, "What the chicken!?!?" There are other solutions I am sure, but the above is the first one that comes to mind based on our experience implementing virtual environments for our clients and our own company. The SBS RWW is the perfect stepping place for virtualized desktops. I have spoken with Microsoft licensing on a number of occasions about licensing on Virtual Server. If we build a box, and sell it, we can install any number of Microsoft OEM licensed OS and Application products. OEM, of course, limits the OEM based virtual machine to run on that box only. An OLP licensed virtual machine is an option for companies that want to move those licenses (virtual machines) from box to box freely without any constraints. In my mind, OEM licensing for virtualization may save $$$ in the short run, but, given the need to move virtual machines around, or the need to add virtual machines and thus replace an existing box, leaves an OEM licensing scheme costing more in the long run. Okay, back to the subject at hand: Microsoft, we need some clarification here. The above paragraph limiting the VMs on a Server 2003 Standard Host OS to ONE (1) Server 2003 Standard edition server guest OS DOES NOT WORK, in my opinion, in the SMB world. Think about this for a minute: We can build a dual processor, four (4) core, based system with up to 32 GB of RAM, any number of drives up to 10 on the SC5400 based Intel chassis for a very reasonable price for the SMB market. The market I am thinking of is the 35 to 70 seat range which is the middle to upper end most Small Business Specialists would be dealing with. The above system running the 64 bit Windows Server 2003 R2 Standard Edition could handle a number of Server 2003 R2 Standard Edition guest OS VMs along with a number of desktop OSs and do it at a very reasonable price point. The above solution provides a very attractive solution for an existing SBS environment and doesn't conflict with current SBS CAL licensing schemes for additional servers on the SBS network. Why would they need to spend the extra $2K+ for Server 2003 R2 Enterprise edition? We get to address over 4 GB of RAM on x64 Standard Edition as all of our hardware is EMT 64 capable (64 bit), thus that negates the need for Enterprise Edition's extra memory abilities on the old 32 bit platforms. We get to work with up to 4 physical processors on the x64 Standard Edition. Keep in mind there is an exponential jump in price when going from a server with two (2) physical processors to four (4) physical processors. The price is also affected significantly by the number of cores the physical processor has. Rarely would we go beyond two (2) physical processors, especially with the availability of the 4 Core 53xx series Intel processors. Going beyond the two physical processors puts us closer to the Small to Medium Enterprise levels especially in pricing. Thus, there is no need to run the Windows Server 2003 R2 Enterprise Edition for additional processor support. So, Microsoft, prove me wrong. Justify to me, and my SMB clients, why I need to tell my clients they need to spend an extra $2K+ for a solution that can be built quite comfortably on Windows Server 2003 R2 Standard Edition!